Whither you want a a great guitarist for your next CD or studio project, or you would like to have Carmen Grillo tour with you this next season - you are at the right place! 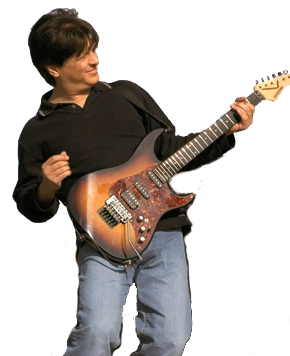 Carmen brings an exciting and seasoned perspective to your music, and he knows how to listen to your needs, as well as play his guitar like a Master Jedi. Sometimes you need that rockin' face peeling solo voice, or maybe you need that laid back ambience guitar, or an accoustic accompaniment to your vibe. Carmen Grillo has you covered, and he knows how to get everyone in the room smiling too. As a master studio guru, Carmen also has the "in-house" ability to add his guitar to your tracks, without having to ship him to your studio for a session. Send him your tracks, and tell him what you want to hear. He will record it for you, and give you an mp3 sample to approve. If you dig the groove, he masters his solo to your specs, and transfers it back to you for you to integrate into your mix. So simple, and so efficient! Of course if you want him on-sight, he is there for that kind of work too. Ready to rock?